Lately, I’ve gotten quite a few e-mails asking questions about coton a broder, a thread used for hand embroidery, so today, I’m going answer some of those questions, while mentioning floche and Danish flower thread, too! #1: Does coton a broder come in colors? Yes, it does. Technically, though, I’ve only seen #25 coton a broder available in a nice range of colors. Most other sizes, you’ll find in white and ecru, and possibly black sometimes. However, a design calls for a #16 soft cotton or coton a broder in colors, chances are, it’s cotton floche you want to look for, rather than coton a broder. Floche (a soft cotton made by DMC) is slightly different from coton a broder, but it comes in a wide range of beautiful colors, and can be used for the same applications as coton a broder. #2: What’s the difference between Danish Flower Thread and coton a broder? 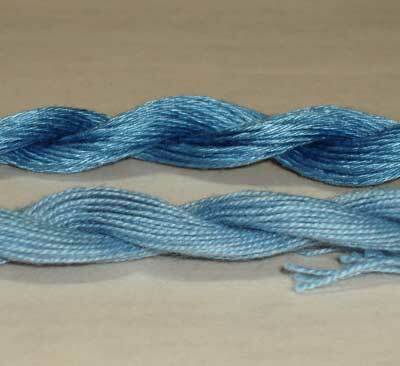 In America, coton a broder is actually a mercerized thread, which means it has a sheen to it. Danish Flower Thread is non-mercerized, or matte, and has no sheen. 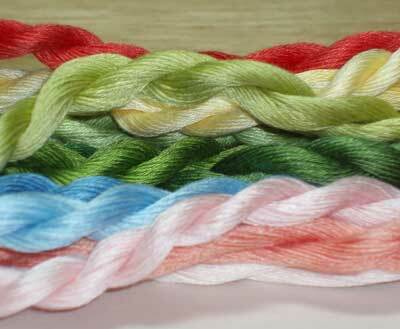 However, it seems that, in other countries (South Africa, Australia, New Zealand), coton a broder is actually a matte thread, the term used interchangeably with flower thread. However (again! ), in America, what we buy as flower thread is definitely more tightly twisted than coton a broder or floche. You can see the individual twists in flower thread more distinctly than you can in floche or coton a broder. The top thread is mercerized (it has a sheen) and has a looser twist. It is floche. The bottom thread is not mercerized (it is matte) and the twist is a little tighter. It is flower thread. #3: Where can I find coton a broder, for cutwork or for colored embroidery? You can also find floche in colors on the same page of the Lacis online catalog. If you’re looking for Danish Flower Thread (matte coton a broder, more or less), you can order that through Hedgehog, on the same page as the link in the above paragraph, or you can order it from Nordic Needle. Right now, it looks as if they don’t have many colors listed on their website, but I saw a whole rack of the entire range of flower thread, so I’m sure you can probably call them with the colors you want. I hope this helps answer some questions about these threads! An Australian here who knows her coton a broder! In Australia too, coton a broder DOES have sheen. As an embroiderer of Mountmellick work, you must have thread that has no sheen. It means that we cannot use coton a broder, because though it does not have MUCH sheen, it does have sheen. Thanks for that. I would think that the terms would be the same world-wide, but there seems to be a discrepancy in their meaning. When I reviewed a book that was written in South Africa, I noted that there was a "mistake" in the book – that the author said that coton a broder is a matte thread, when it's really a mercerized thread. "In Australia and the UK both coton a broder and flower thread are matte, ie both are not mercerised and are totally dull…"
It'd be interesting to clarify this a little further or to get some insight into why some people call the different threads what they call them! Hello, just recently found your site. There sure is an abundance of information here. I'm new to embroidery so I'll be sure to visit often. Stop by and visit me soon. hi Mary….interesting about coton a broder, yes, the product marketed here in the US certainly had a tad of sheen. I used to carry sizes 12 and 16 in my shop in all the colors available here, which was limited to maybe 50 brights plus black, white, ecru, brown, etc. Eastern Europe for peasant type embroidery, hence all the bright colors. In fact, one of the few other shops that I knew of that had the whole range was in an ethnic neighborhood in NYC. I loved it for needlepoint so kept it all when closed shop 10 years ago. Recently put over 200 skeins on Ebay and it went for about the old retail price, so there's someone else out there that likes to stitch with it. Hi, I found your discription beween Floche ,and coton a broder so very informative ,I thank you very much. I am fairly new to white work which I enjoy but so far have used the DMC stranded cotton only , as I felt floche and coton a broder some what confusing , not quite knowing ,what to use where. And of course, I supose here in the UK we seem to have a slightly different meaning ,again. I love the idea of the soft ,shiny thread !!! I have been all over the net and have not been able to find floche. It looks like a great thread and I would love to try it. I live in Australia but happy to buy from wherever. ETSY has some advertised but I’m not able to get to the site. All very weird. HELP!!!! Hi, Heather – try Hedgehog Handworks, online. They have it, and they sell it in smaller twists, so that you don’t have to buy the whole large skein. The skeins of floche, as produced by DMC, are pretty hefty – 168 yard skeins – but Hedgehog breaks them down into 30 yard skeins for a fraction of the price.